Use S136 stainless steel plate specially for plastic product mold, perfect anti-rust and anti-corrosion performance, high sheet hardness HRC35-40, with the aging treatment and the elimination of stress, no deformation after long time use and surface grinder accuracy up to 0.01mm. The mold frame is a one-time clamping all the template processing, to ensure the concentricity of forming hole and guide column, with high overall mold frame precision. Made of S136 material (Sweden ASSAB), with aging treatment & heat treatment done originally. The structure of the core and the mounting base adopts the taper positioning type, which can be split and directly formed by the core and the screw mouth to form the cone contact positioning so that the length of the screw mouth is shortened and the screw mouth is cooled more evenly and quickly. The short screw mouth is favorable for increasing the preform transfer efficiency and reducing the risk of incomplete grafting, preform transfer speed significantly improved. The waterway of screw mouth is W-type, more fully cooled, preform bottle temperature decreased, reducing the shrinkage fluctuations by bottle neck overheating. The screw is processed by Swiss AgieCharmilles spark machine and both inner & outer circular grinder, the taper precision is up to 0.005mm. The cavity is split-type, using spiral circulating water way, and can achieve the cooling effect of the preform quickly, and the cavity bottom damage can be replaced independently, effectively reducing the maintenance cost and shortening the preform cooling time. The forming parts of Sweden ASSAB S136 domestic factory to aging, heat treatment hardness: HRC52 degrees, provides great wear resistance of mold, the service life is obviously enhanced, all sliding parts contact surface inlaid self-lubricating wear-resistant copper alloy. The cylinder piston flew with the hot runner, won’t accure the core difference of the valve needle and the mold cavity because of the expanding due to the hot runner heating up, and the cylinder and the hot runner plate is not a precision fit structure, can be arbitrarily disassembled, easy to maintain. 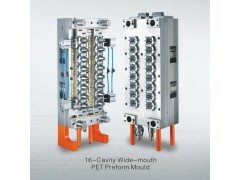 The components are the same as the international famous brand molds, and the parts can be interchangeable. The hot runner is equipped with an independent person responsible for the assembly, there are standard operating standards and testing procedures, with the multi – point and multi - layer balanced filling structure, to ensure the consistency of each mold cavity injection schedule. Hot runner uses the embedded square heating tube heating, the heating pipe around the shape of the runner layout, with fantastic heat transfer, can ensure that the temperature’s consistency of the injection point. While with the special nature of the design, make the heat expansion coefficient to the lowest point, make sure the accurate of each injection point’s location, AA value stability. Spare parts is processed in the stable temperature workshop, through the German DMG six-axle turning and milling composite machine and CNC grinding machines and some other high-precision equipment, dense processing equipment with heat pipe around the shape of flow channel layout, with better heat transfer. Adopt the three Coordinate detector for inspection to ensure the dimensional accuracy error of parts processing reach only 0.01mm. Since the improvement of the processing precision and the reasonable design of the hot runner system, the weight deviation of the same mold down to 0.2 gram. High-precision machining conditions and material properties, hardness and other enhancements to ensure the stronger wear ability of the mold, so the mold normal life of up to 300 million times which is applicable to high-speed and high-efficiency injection molding system. Since the updat of the hot runner technology and spare parts hardness, the annual normal maintenance costs over the warranty period is about 2%. Since the change of structural, exhaust function has been greatly improved, with the stabile hot runner system, reject rate only reach 0.3% or lower.